Brightonians, and those prepared to travel from further afield! We are playing the A23 Club (above the Hydrant on London Road) this coming Saturday (17th November). We are on at 8:30 so be sure to get there early..
We've just come back from playing the Blyth Power Ashes, and it was, as a certain Future Radio presenter would say, Bloody Marvellous. Our first gig with Nic on bass and Malc on drums, a winner of a rhythm section all things considered! Probably the most fun gig we have done! It's been a busy month, as well as preparing for the Ashes, we also signed to Swedish label Substream and released our new EP. Catface EP is availble now as a limited edition CD from Bandcamp It is a limited edition of 50 supplied in beautiful digi-file case with original artwork by Sally Taylor. Each individually hand numbered. First 10 people to order will receive an ULTRA limited edition bonus CD, containing a selection of bonus tracks, with hand-made packaging featuring (laser cut) felt logo! So order now before they run out. On September 17th Substream will be releasing it on all major download outlets, more information soon. This Thursday we will be playing The Green Door Store in support of London Commands You's single launch. We'll be on stage around 9pm. We'd love to see you there! Thanks to Sally Taylor for the lovely artwork she's made for us. As recycling is so popular nowadays, this art will also feature on our forthcoming EP, probably. In other news, awesome to see that our End of Fairytales EP is being now being downloaded in the US! 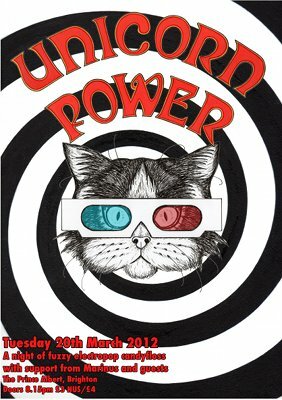 On Tuesday 20th March we'll be playing at the Prince Albert (on Trafalgar Street) in Brighton. It's probably our favourite live music venue in Brighton. Come and watch us. We promise to fill your ears with electronic candy floss! Things are occuring here at Unicorn Power Towers. Today we were featured on the excellent music blog Neon Filler check it out! Also, we've got a song coming out on a compilation CD from Swedish label Substream later in the year which we're really excited about. We're currently beavering away recording our new EP, hopefully have that ready in the coming months. We plan to do some kind of physical release for this one, probably with another handmade cover that will take me far too long to make. To celebrate this burst of activity, we've hopefully got a Brighton gig coming up in March too, will give more details when we have them YAY! Happy New Year everyone. We've just been ranked number 10 in Louder Than War's Top 57 bands of 2012. YAY! Watch this space for imminent gig details and new releases in the pipeline. To celebrate Christmas and the New Year, and to attempt to divert ourselves from all the eating and drinking, we have recorded a new song. It's a cover of 'New Year's Kiss' by Casiotone for the Painfully Alone. We've also made a little video, filmed at the Unicorn Power Christmas household. If you're interested in such things, you can watch it in HD, if you watch on youtube. Hope you enjoy it! Our new single 'Guarded' is now available to stream from our Music page. We plan to release it soon. I got over excited and had some felt logos LASER CUT to go on the cover! After our hugely enjoyable recent gig with the lovely Ham Legion and Raised on Replicas, I've been inspired to do some more recording and possibly even make a new video. Lots of ideas that will probably prove impossible, watch this space! We'll be playing our first gig of the year this coming Saturday at the Fitzherberts in Brighton. It's totally free and we are playing with two awesome bands - Ham Legion and Raised on Replicas. BBC Radio Sussex are going to be playing 'Moving On Demand' this Sunday between 7pm-9pm. Listen live on 95.3 FM or online www.bbc.co.uk/sussex . You can add comments at unsigned@bbc.co.uk or text 81333 (you have to start the text with the word 'radio'). We'd love it if you did want to add comments! That way they might even play us again. Just finished editing the video for Broken Maths, hope you like it! Thanks to Martin and Harley for helping us film it at the old cement works in Shoreham. Well, it's been quite some time since we last released anything (it's amazing how long things take when you are doing everything yourself!) 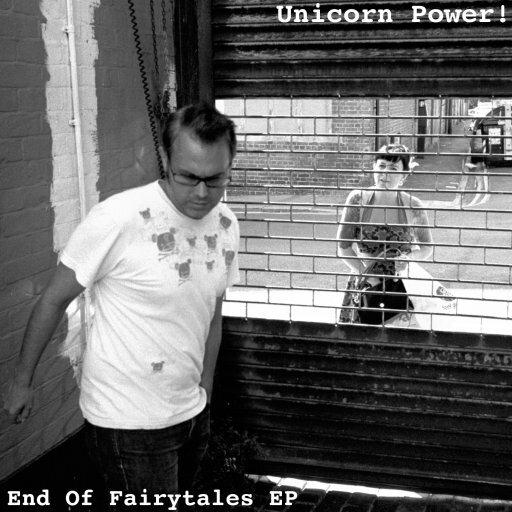 But we are now releasing the 'End Of Fairytales EP'. At the moment it is digital only, but you can download it totally free! We hope you like it. Click on the 'Music' button to stream, but to download (in the format of your choice), click here . You will have to give us your email but we promise to look after it and treat it nicely. Thanks to Ingimar for his appearances on this. He has now skidaddled back to Iceland so won't be playing with us in the foreseeable future. He also took the photo we are using as cover art. This is just outside Peppercorn Studios in Brighton where we recorded some of their lovely vintage analogue synths (A Korg Mono Poly and a Sequential Circuits Pro One for those interested) which feature on Broken Maths. 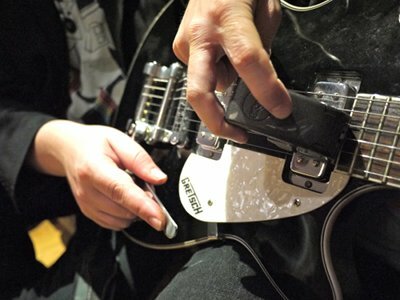 We have completed 2 new tracks which have just gone off to be mastered at the wonderful MOTTOsound. Expect to see them up here soon. 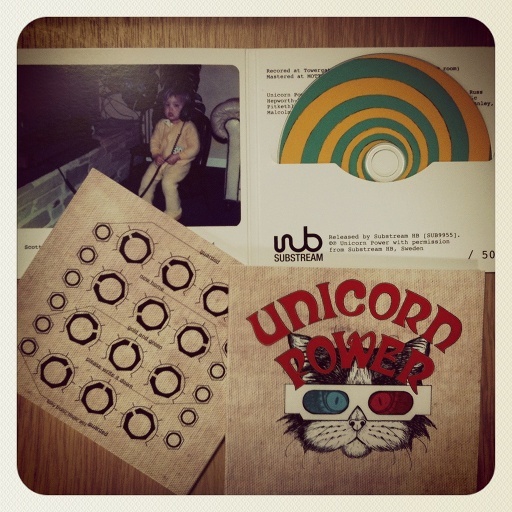 More exciting Unicorn Power news to follow.. The debilitating snow which has paralysed most of the UK has at least given me some time when I should have been at work to do some more recording. This is exactly what happened last year and allowed me to record the bulk of the Stencil EP. Hopefully we will be releasing some stuff in the next month or so. Fingers crossed we will be doing a split release with Raised on Replicas who recorded 3 AWESOME songs last weekend. In the meantime here is the New York video of us as promised! Unicorn Power play New York from Scott Pitkethly on Vimeo. Back in blighty now refreshing our memories of its inclement weather. New York gig was terrifying but fun in retrospect! Despite not being exactly well attended and the sound lady disappearing before we'd finished our first song it was an enjoyable experience. Working on a video condensing our trip into a few minutes of excitement, watch this space! We're just about to head over to Williamsburg to Pete's Candy Store for our gig tonight. We went there on Friday to see Mia Riddle (who were great). It's a great venue, quite small but very friendly which slightly eases the nerves. All sorted for instruments now, Annalise hired a bass and I've bought a new Telecaster, lovely! Having lots of fun in NYC. Checked out the High Line, an old Metro line thats been turned into a park, albiet one suspended 20ft above thr streets of Manhattan. Lots of frantic live experimental music being played up there, fave sight so far. We have successfully arrived in the Manhattan East Village! We chickened out of bringing our guitars due to fears of Customs demanding performance visas and Virgin's unreasonable excess bagage charges. So we will need to track down some stringed instruments before Sunday. Apartment has a great resident vinyl collection and a great resident (morbidly obese) cat called Le Tigre. Bed situation is reminicent of 'Being John Malkovich'. Thanks so much to Dion for making us this AWESOME poster for our gig in NYC in September. 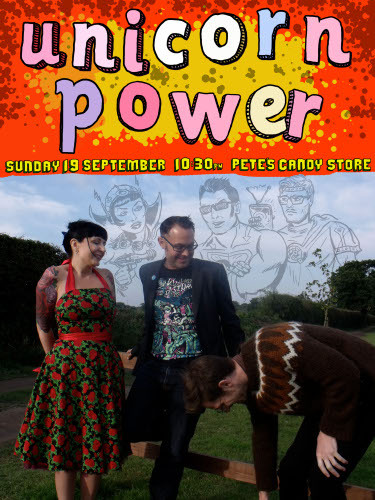 We played a few weeks ago at the Blythe Power Ashes festival in Norfolk which was great fun apart from some onsatge laptop failures, unfortunately I have no idea what the problem was so it could happen again at any moment! 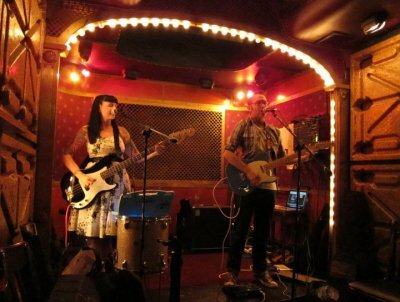 In an incredibly exciting turn of events Unicorn Power are playing a gig in New York! It's taking place at Pete's Candy Store, Brooklyn on September 19th at 10:30pm. We are SO excited about this! In other news the EP is now on sale from bandcamp and we are doing more recordings this weekend. Deacon has very kindly offered us a support slot at his gig at the Duke in Shoreham on Saturday 10th April, Boy in the Cupboard will also be playing, so it should be a fun night! In other news we have been working on some more polished recordings of our songs, they should be ready soon, currently planning on doing some handmade cases to contain them, DIY man! So it's Two Thousand and Ten which is officially THE FUTURE! Unicorn Power! have now got a gig under their belt, and it actually went really well, despite some of us being somewhat terrified. The plan now is to try and get some decent recordings of our songs to give out as demos and maybe even to release them in some format. Also I had another Immersive Music Day (basically involves locking yourself away for 12 straight hours and trying to write as many songs as you can whilst going slightly mad). I think at least a few of those songs could be useful, so once we have some more material we can do another gig! In an effort to galvinisise us into action I've booked us a gig! It is on Thursday 17th December at the Cella Bar under the Sanctuary Cafe. Not sure we are quite ready yet but hopefully the added pressure will force us to get it together. Why not come along and see if this works out?